Joy Golden, creator of several outstanding award-winning radio campaigns passed away on August 29, 2015. Joy's most "famous" campaign was for Laughing Cow cheeses and featured comedic writing and acting by a character she created called "Enid." Sales of Laughing Cow jumped 60% in the New York area in the first year - a figure matched or exceeded in other markets where the ads were broadcast. During her career, Joy Golden went on to create hundreds of radio spots for Evian, Hebrew National and other clients. 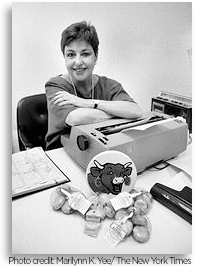 According to a 1992 interview with "Positively Lynn," Joy was quoted as saying "…little did I know that (Laughing Cow's Enid) would make me famous. I went from nothing to international fame. I was in The New York Times, Museum of Television and Radio and I said, 'Goodbye' to the world and said 'I'm opening my own business, Joy Radio.' I was 55 and I was a hit, kids." The radio industry salutes Joy Golden and thanks her for being a radio creative pioneer. You can listen to Joy's Radio Mercury Award winning spots by clicking here and typing "Joy Radio" in the Agency search box.